"That's impossible. There aren't two Chinese Communist divisions in the whole of North Korea." Catastrophe is about to strike Eighth Army and X Corps. Given authority on 6 October to pursue the NK across the 38th parallel, UN forces drove north. ROK I Corps advanced up the east coast. X Corps embarked at Inchon and Pusan for another amphibious assault. EUSAK's I Corps entered Pyongyang on 19 October. The 187th Airborne RCT dropped 30 miles beyond. ROK's reached the Yalu at Chosan on 26 October. X Corps landed on the east coast and pushed towards the Yalu. By the end of October the surviving NK army was fighting mainly guerilla actions. 135,000 prisoners had been taken. But veteran Chinese (CCF) troops had crossed the Yalu and had already struck overextended UN units. 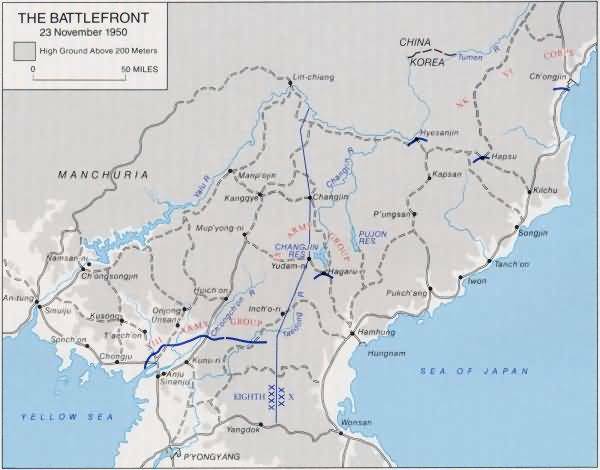 While EUSAK consolidated along the Chongchon, X Corps reached the Yalu at Hyesanjin, ROK I Corps pushed into the north east corner of Korea 60 miles from Siberia. The British 29th Commonwealth Brigade, a battalion from Thailand, and South African air units arrived in Korea. 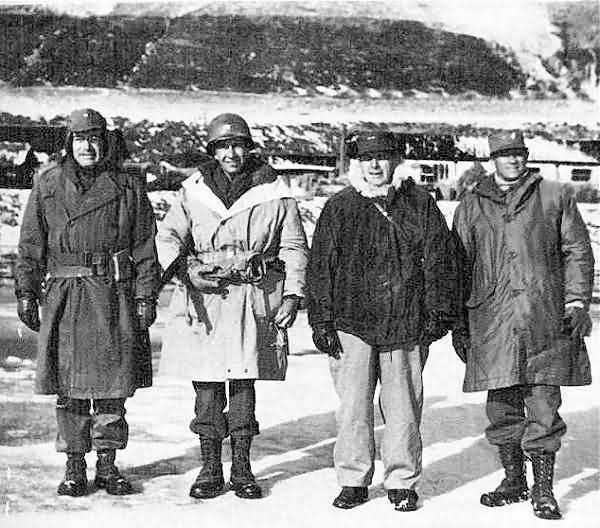 Seemingly thinking that victory was at hand, MacArthur announced on 24 November the final drive to the northernmost limit of the Korean peninsula. In retrospect it seems obvious that after China's 1st Phase Offensive we should have stopped for the winter, forming a defensible line across the narrow peninsula neck from Pyongyang to Wonsan. That would have won the war, but the CIA misjudged China's intentions. When the CCF broke off to evaluate the results of their first attack and re-group for their next, General MacArthur misjudged their strength.